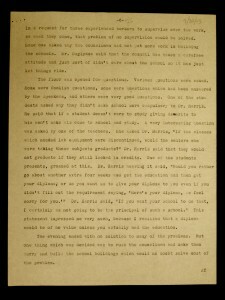 Among Asian American groups, the Japanese had the unique privilege of attending some of the best schools in California because of the 1907-1908 Gentlemen’s Agreement, which allowed Japanese American children to attend white schools. As such, Japanese American children had access to many more benefits in their educational experience compared to other Asian immigrant groups. However, U.S. Japanese Incarceration began in the 1940s as a “military necessity” and response to the attack on Pearl Harbor on December 7, 1941 and Japanese involvement with the Axis Powers against the U.S. in World War II. Japanese Americans, often times whole family units, were relocated to concentration camps, centers, and prisons, effectively pulling Japanese students out of esteemed education systems. Poston was a concentration camp that faced many problems regarding its lack of an education system. 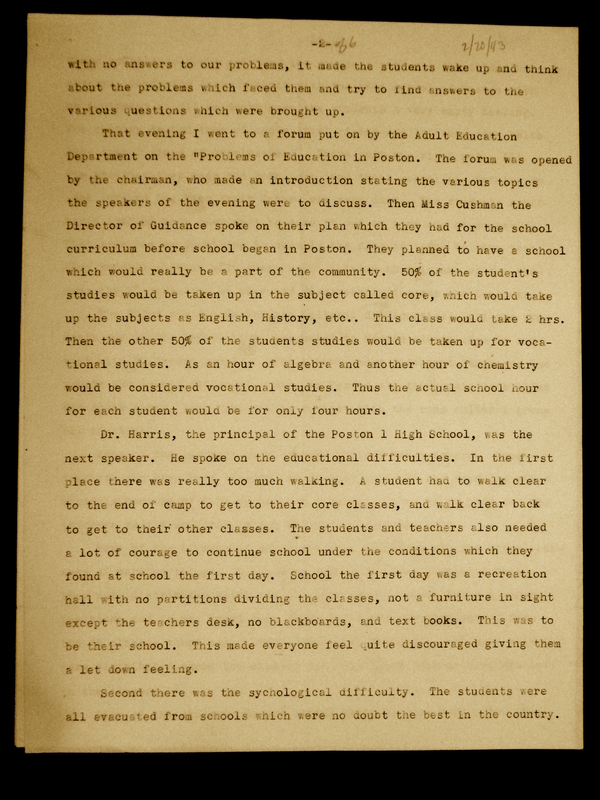 A report by an unknown A.T., presumably a Caucasian member of the camp’s administrative staff, from February 20, 1943 summarizes an Educational Forum about the Problems facing the Education system in the Poston concentration camp. This report was written as a summary and personal response to the topics covered at the Educational Forum, similar to a journal entry. The Nisei group valued education as one of the only ways to secure their role as responsible citizens, succeed economically, and assert themselves as Americans. Due to the poor schooling system in Poston, many students saw a bleak future. 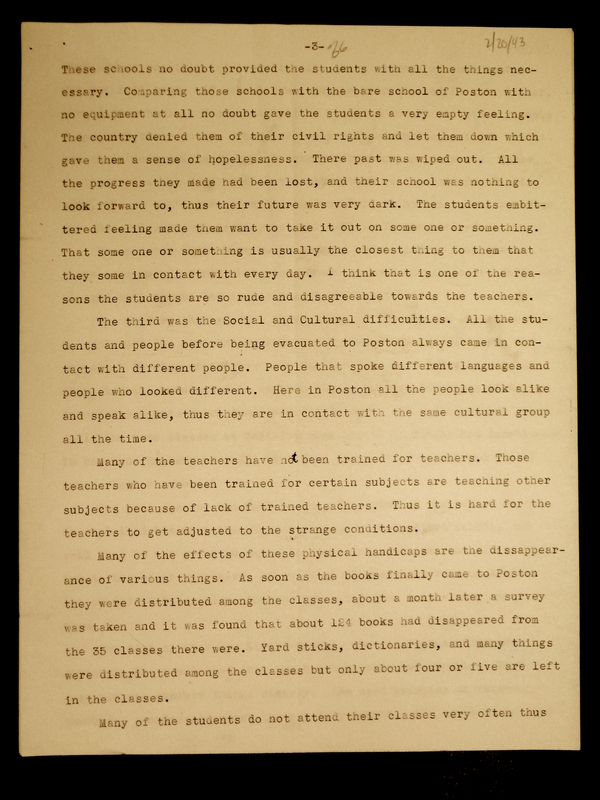 The Nisei felt discouraged by the lack of educational opportunities, schooling structure, and learning resources due to Poston’s inadequate resources and non-centralized school, lack of qualified teachers, and resentment against Caucasians for Japanese internment. Many of the school-aged Nisei were pulled and evacuated from some of the “best schools in the country”. 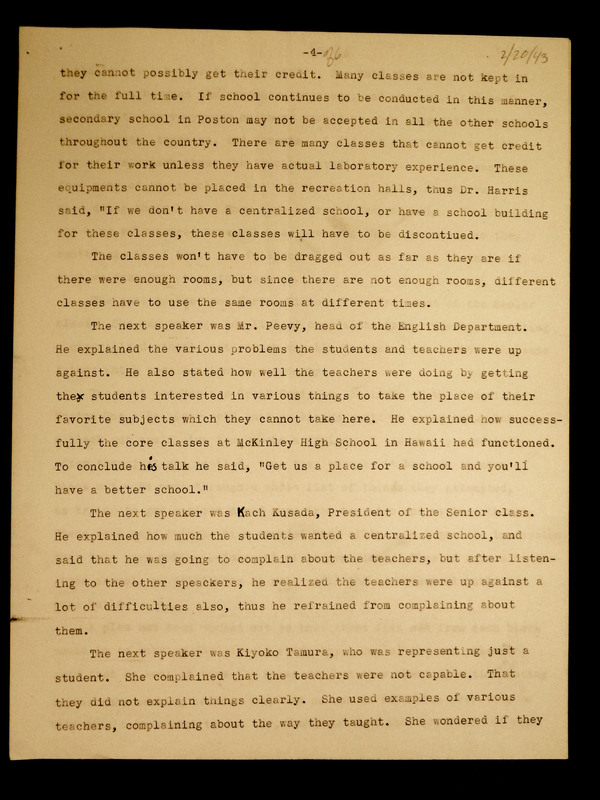 In contrast, the schools in Poston had very minimal resources and supplies available to the students; the schools were bare and often contained no chairs, tables, or blackboards. 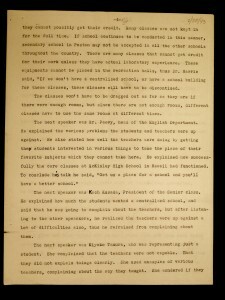 Furthermore, the school could not support the inclusion of certain classes and therefore was not credited in the majority of school systems in the country; even if students completed their education at Poston, they would not be credited or accepted into schools upon their return and re-integration into society. As a result, the students became discouraged and lost their motivation to attend school and dedicate their efforts to their education. This lack of financial support from the U.S. government and the illegitimacy of the schooling systems in the concentration camps show how the U.S. government did not care about the development or re-integration of these Japanese Americans as educated citizens. Poston consisted of three camps, I, II, and III, and all were three miles from each other. The school day was broken up among camps I, II, and III, causing organizational difficulties for the schoolteachers and frustration for the students. The non-centralized school structure required students to travel miles in between classes. The cumbersome nature of having to walk multiple miles a day for class discouraged many students from attending school. As a result, teachers had no accountability for their students. 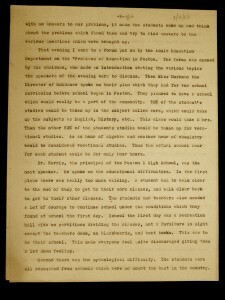 From having to go from the best schools to Poston, the students felt that the U.S. government clearly did not prioritize maintaining a similar quality of education in and outside of the camp for Japanese Americans. In the forum, A.T. also recounts that many students blamed a lack of trained and qualified teachers for low morale. 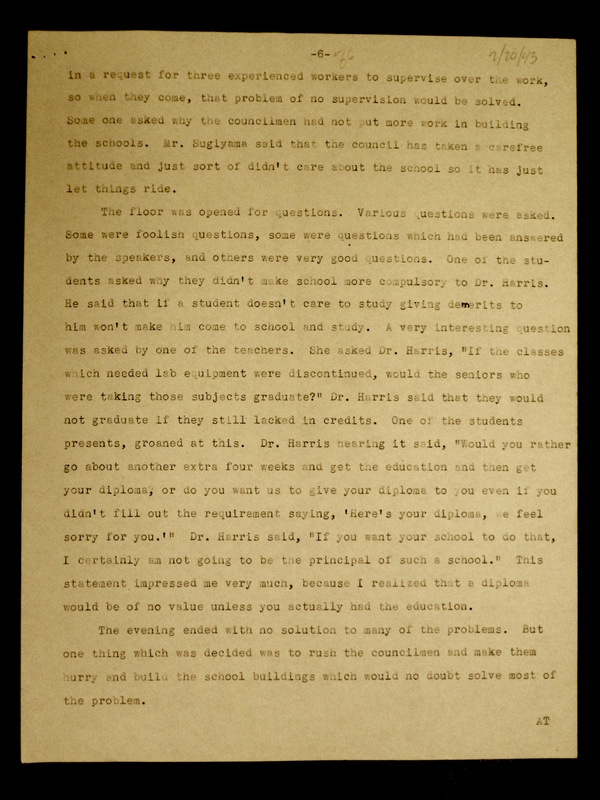 Students stated that the “teachers were not capable” and therefore “had no confidence in them”. In actuality, many of the teachers were not trained and often times were Issei volunteers. A.T. attributes the students’ disagreeable attitudes toward the Issei teachers to the power shifts between Nisei and Issei at the camps. Many Issei became passive of their situation in the camps, causing the Nisei to emerge as community leaders and to assume agency over their situation and future as reintegrated citizens. The students may have felt resentful that they now were learning from parent volunteers compared to trained professionals in their former schools. The Nisei could no longer see the Issei as respected figures of authority, neither as perceived professionals nor familial. 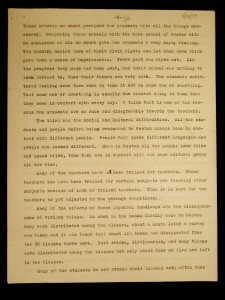 The lack of confidence in these Issei teachers points to a larger lack of faith in the Issei class to help change the role of Japanese Americans in American society. To compensate for the shortage of teachers available within the camp, the administrative staff hired many Caucasian teachers from outside the camp. 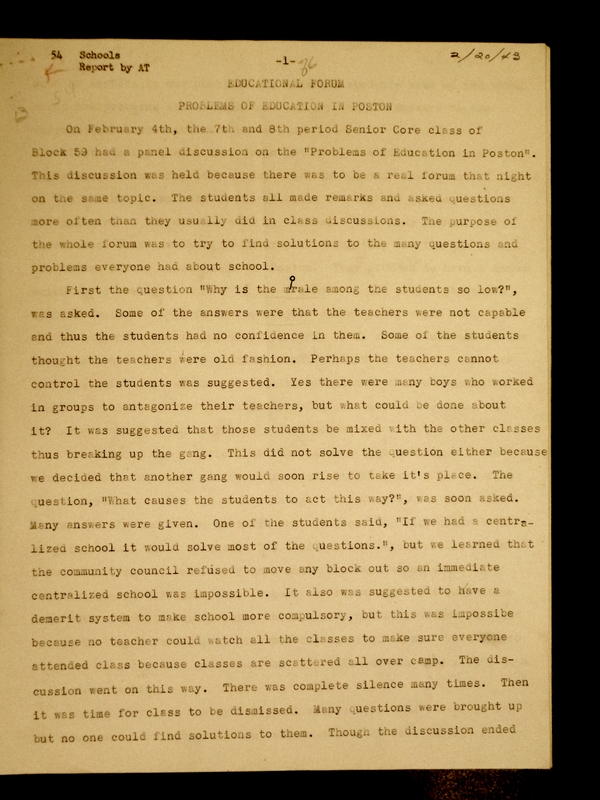 Additionally, the students’ lack of trust in the teachers could be attributed to the employment of Caucasian teachers. 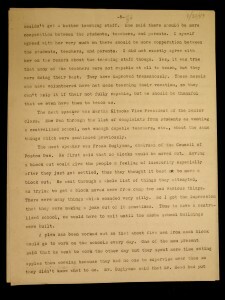 A.T. also attributes low morale to the Nisei’s bitterness over their internment. Their relocation produced a sense of hopelessness and neglect from a “country [that] denied [Japanese Americans] of their civil rights and let them down”. The Nisei felt that they were being punished, more so than their Issei counterparts, because they were U.S. citizens, identified as American, and yet diminished to criminals because of their race. The Nisei felt that they did try to show patriotism, evacuating peacefully and continuing to demonstrate signs of good citizenship and racial uplift, but were still being punished through the lack of a proper education and a deserved prosperous future. As victims of a systemized form of racism and oppression, “Japanese Americans were critical and suspicious toward the administration and staff at Poston”, and believed that the WRA was corrupt. 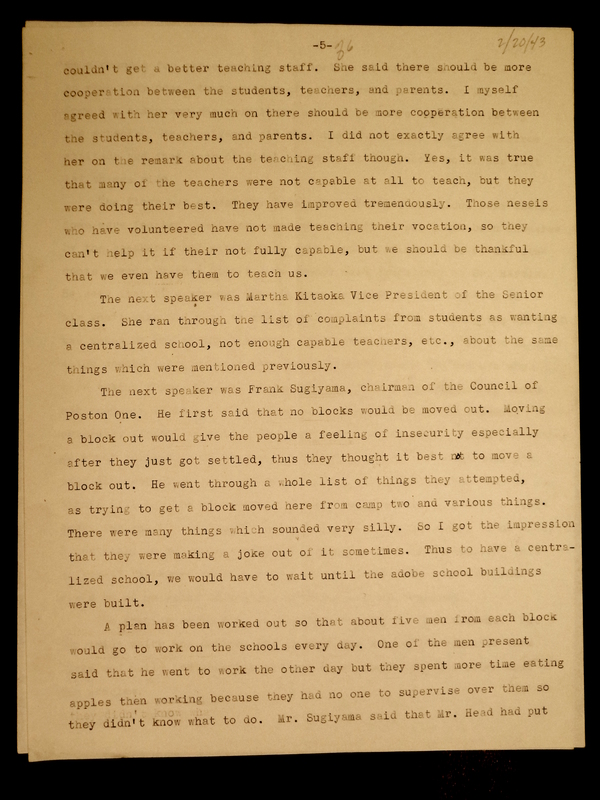 In particular, the Japanese faced oppression in the form of neglect, as evidenced in the “carefree” attitude upheld by camp administration regarding making necessary changes to the schooling system and building a centralized school; the administrative staff would “just let things ride out” without any concrete commitment to improving the school system for their camp members. A.T. appears to be sympathetic to the Japanese, showing his/her appreciation for Issei volunteers teaching at the school and blaming the U.S. government’s treatment of these Japanese Americans for students’ low morale and bleak futures. Though some Nisei continued from camps to universities, they assumed the burden of portraying the entire Japanese race as not only model minorities but also model citizens. Relocation was a temporary solution to war that limited and retarded the development of the Japanese American as an accepted member of American society. Okihiro, Gary Y. “NISEI.” In Encyclopedia of Japanese American Internment. Santa Barbara, CA: Greenwood, 2013. http://ebooks.abc-clio.com/reader.aspx?isbn=9780313399169&id=A3691C-1508. 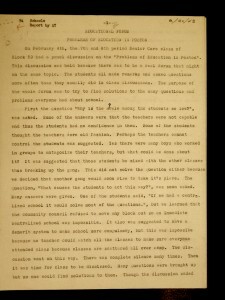 A.T., Educational Forum: Problems of Education in Poston, February 20, 1943. Manuscript. From Cornell University Japanese American Relocation Centers Records. Okihiro, Gary Y. “CAMPS, CENTERS, AND PRISONS.” In Encyclopedia of Japanese American Internment. Santa Barbara, CA: Greenwood, 2013. http://ebooks.abc-clio.com/reader.aspx?isbn=9780313399169&id=A3691C-2070. Chrissy Lau, “World War II and the Politics of Incarceration” (speech, Ithaca, NY, October 21, 2014). Thomas, Dorothy Swaine and Richard S. Nishimoto. The Spoilage. Berkeley: University of California Press, 1946. Lau, “World War II and the Politics of Incarceration”. Thomas, Dorothy Swaine and Richard S. Nishimoto, The Spoilage.